Understanding a wine label take you a step toward solving the perennial puzzle—how good is this wine? At Wine Embassy, you can taste many different types of wine in Saigon. Browsing the shelves of one of my favorite local wine merchants, a cozy little shop in London where the wines are stacked in bins that stretch from the floor to the ceiling, I was faced with a scrambled collage of labels. There were wines with chickens on the label, wines with etched drawings of Neo-Gothic houses, brightly colored Impressionist-style labels, watercolors depicting far-off vineyards or simply the name of a French village written in attractive, bold font. Some wines had the name of the grape variety clearly marked across the label, but on the whole the display presented a pretty mysterious picture. To those unfamiliar, this label is wonderfully cryptic. Let me talk you through it. Vacqueyras is the name of the appellation that lies between the villages of Sarrians and Vaison la Romaine in southeastern France. The producer is Perrin & Fils, who made their name with the famous Châteauneuf-du-Pape wine, Château de Beaucastel. In short, they are one of the most reliable wine producers in the Rhône and a name to look out for. The blend is 75% Grenache and 25% Syrah, and it is exquisite. The nose is joyous, with supple notes of raspberry, blueberry and blackberry, while the finish is intense and powerful. A wonderful wine to accompany roast meats, stews and hearty foods. No wonder most people were wandering around in silence, I thought, afraid to reveal their lack of knowledge. The subject of wine can reward a lifetime of study, but for those coming to it for the first time, it must feel like a puzzle. The good news is that armed with just a few simple rules, you can decipher the most complicated of wine labels, helping you avoid the pitfalls of confusing a sweet with a dry wine or a full-bodied red with a light, fruity Beaujolais. Of course, there are myriad exceptions. But when it comes to European wine, the first puzzle to solve is that wine producers use location as the descriptor of the taste, style and character of a wine, and not grape variety. If it says Burgundy on the label, it will be a Chardonnay if it is white, or a Pinot Noir if red. As a rule of thumb, the more specific the location, the higher the quality of wine. For example, Meursault in Burgundy is the name of a village with a particularly strong reputation for producing Chardonnay. Saint-Émilion is a village outside of Bordeaux, whose neighboring vineyards are known for producing blends of Merlot-dominated red wine. So a wine with Saint-Émilion on the label will be more interesting than one that is labeled as a generic Bordeaux. Every region uses a specific blend of grape varieties, which, with a little application, one can learn. The year the wine is made is referred to as the vintage. Most wine is made to be drunk straight away, certainly within five years of its bottling. Fine wine benefits from bottle age, as it develops tertiary characteristics and more mature, complex flavors. These wines can be cellared for 10 to 20 years. The numbers on the bottom right-hand corner of the label are the alcohol percentage. 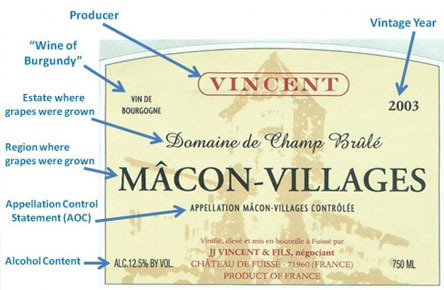 Labeling rules can vary by country, granting the winemaker a tolerance of around 0.5%. So it’s worth remembering that if it is as high as, say, 14%, it could actually be 14.5%. Regular readers will know that I favor drinking wines with an alcohol level of 11%-13.5%, which sadly, due to modern viticultural practices that favor a fuller, riper style, are becoming harder to find. Labels also offer a slew of other information, from the name of the individual vineyard and the winemaker, to whether the wine has been bottled at the winery, to whether it has been produced from old vines, or “vieilles vignes” (older vines produce fewer grapes, with more concentration and flavor). All of these tend to suggest the wine has been made by an individual winemaker from fruit grown in the estate’s vineyards. Aside from the label, one can also identify European wine by looking at the shape of the bottle. All Bordeaux wines come in a high-shouldered, straight bottle. The glass is green for red wine and clear for white. Speaking generally, outside of France, these high-shouldered bottles are used for a plethora of styles, including Cabernet Sauvignon, Merlot and Malbec. Gently shouldered bottles are found in Burgundy, the Loire and the Rhône. Outside of France, these are also—but not without exception—used for bottling Pinot Noir and Chardonnay. Long, thin bottles are used in Germany and Alsace. These invariably contain Riesling, Pinot Gris, Pinot Blanc and Gewürztraminer. In Germany, green bottles indicate the wine comes from the Mosel, and brown from the Rhine, where the wines tend to be drier. These general guidelines will help in understanding a wine label and, more importantly, take you a step toward solving the perennial puzzle—how good is this wine?